Martin Cooke, technical manager at EOGB Energy Products Ltd, looks at the steps that need to be taken to ensure a successful commissioning process. Commissioning is an extremely important and necessary part of any plant installation process to ensure it has been correctly installed to industry standards as per IGEM/UP/4 Edition 3 and IGEM/UP/10 Edition 4. Additional guidance should also be taken from BS 6644, BS 6230 and BS 6880, BS EN 676 and as stated by the manufacturers of the plant equipment. A commissioning engineer’s role is extensive and varied as they must have a thorough knowledge of combustion principles, mechanical functions, electrical controls, current regulations and legislation. Commissioning is an area of work that should not be looked upon as an unnecessary process that can simply be done by the installer at the point of installation. However, sadly this is often the case, especially in recent tough economic times when companies are looking to reduce costs and a final commissioning can be perceived as a cost that can be avoided. Often the client may be under the impression that the installation has been fully commissioned and adjusted to ensure maximum possible efficiency and not simply ‘turned on’ and handed over. After any required health and safety site inductions have taken place and the client has issued the commissioning engineer with the correct permits to work, it’s important to have an initial meeting with the person who will be in charge of the plants’ operation, or the engineer in charge of the installation who will be handing over to the client upon completion. Are boilers or plant machinery and/or equipment installed correctly, safely and to manufacturer’s instructions? Is the area safe to have this installation installed? Is the gas supply correct? Is the flue correctly designed and installed? Are the necessary electrical supplies correct? Is the equipment installed suitable for the application intended? During any initial checks prior to attempting to run the plant, the equipment (in this case the boiler and burner) needs to be inspected to ensure that the installation is correct. Three Phase Motor checked for voltage and correct rotation. In order to check the safe operation of the installation, a dry run procedure must be performed. This ensures that the burners start up and lockout sequences are operating correctly before introducing gas. Once the preliminary safety checks have been completed, the live run procedure can be carried out. After a successful ignition, the controls can be checked for successful shutdown when enable is removed. The combustion process can then begin. Guidance from the burner manufacturer can be sought if required, but all stages must be checked thoroughly. It’s extremely important to monitor O2, CO2, CO and flue gas temperature carefully with a calibrated combustion analyser to achieve good combustion. The low fire flue gas temperatures also need to be observed and the flue gases and a true gas rate of each appliance checked accordingly. Stoichiometric calculations are often discussed but realistically cannot be achieved in practice as a reasonable percentage of excess air is required to maintain complete combustion. By looking at the chemical reaction, to burn 1m3 of methane requires 2m3 of oxygen, and the products of this combustion are 1m3 of Carbon Dioxide and 2m3 of water. It is important to remember that air in the atmosphere contains 21% Oxygen, so to burn 1m3 of natural gas you need 10m3 of air. As discussed, a percentage of excess air is then added on to the combustion process to maintain a safe combustion. 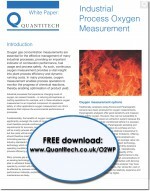 Excess air is often calculated on a combustion analyser, but can also be easily calculated if the oxygen levels recorded in the combustion analysis are known and the oxygen content in air is 20.9%. A typical example would be to add 5% O2 to the combustion process, and the calculation below indicates the percentage of excess air within the combustion process. Both too little and too much excess air can encourage carbon monoxide to be produced. High excess air content can also encourage higher heat losses out of the flue, so it’s important to be aware of excess air levels during boiler commissioning. Once the plant has been thoroughly checked and all safety interlocks proved, it can then be handed over to the site and all necessary operative training provided, including advice on maintenance schedules discussed. With the tightening of NOx regulations there are clear advantages to utilising the latest technologies to reduce emissions. Bernard Dawson of Riello Burners considers options such as flue gas recirculation in pressure jet burners. Steve O’Neill, technical specifications engineer at EOGB Energy Products Ltd, looks at how the implementation of new heating technology can have a significant effect on the efficiency of industrial heating systems. Steve O’Neill, Technical specifications engineer at EOGB Energy Products Ltd, focuses on energy efficiency in non-domestic buildings and how forced draught burners still play a role in reducing emissions.